Welcome to webPD by Smekens Education, where you have on-demand access to more than 150 professional learning videos. If you’re ready to enhance what you’re already doing to build successful readers and writers, you’re going to love the simple and effective strategies you’ll find on webPD. 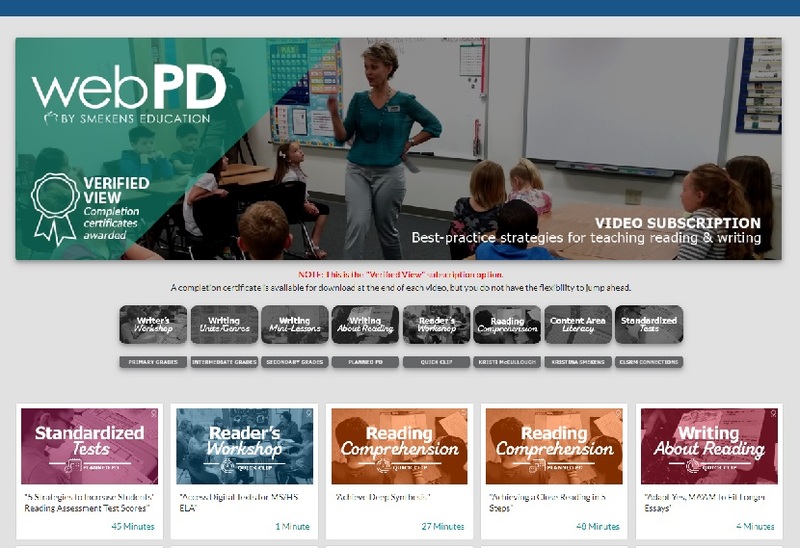 Each of the videos on webPD are led by either Kristina Smekens, our president and lead consultant, or Kristi McCullough, our expert in elementary reading. Both Kristina and Kristi are full-time literacy consultants who pull from their own classroom experience, plus researched best practices, to share practical strategies that work. You have been registered for our “Verified View” subscription option, which means that you are not able to fast forward or jump ahead in any video. But, because of the "Verified View" feature, you will be awarded a completion certificate after each video session has been completed. So, on future instances when you log in to the site, you will see that there are two video subscription options available – the Flexible View and the Verified View. You will want to select the green “Verified View” option. The next step is to select a video to watch. You’ll notice that videos can be sorted by a variety of categories to make it easier for you to narrow your selection. But beyond the obvious categories, you can also use the search function located in the corner of your screen. This will help you to locate videos that focus on a specific area of interest. Planned PD videos are longer. You will want to plan ahead in order to block out time to view the session. These longer videos always include a downloadable handout that you can use to take notes. The Quick Clip videos are short and can typically be viewed in just 5-7 minutes. While the Quick Clips don’t include a note-taking handout, they almost always include a corresponding article, along with a downloadable teaching tool. After you’ve selected a video to watch, simply start with the first section, and begin viewing. To advance through the session, simply click on “NEXT” or "PREVIOUS" after the video has finished playing. Once you have viewed all parts of the session, you are welcome to use the OUTLINE feature to go back to review selected areas. Beyond this visual reminder, you can also visit your personal profile. Here you’ll find a full list of the videos included with your subscription, along with the completion status of each video. This is also where you can return to retrieve the completion certificates that you have earned. At any point during your subscription, don’t hesitate to reach out to our team with your questions. Our email address is webPD@smekenseducation.com, and our toll-free telephone number is 888-376-0448.